Announcing….PRINCETON CLUB OF SOUTHERN CALIFORNIA’s NEW Lecture Series, featuring graduate alumni lecturers. ALL PCSC MEMBERS INVITED: This lecture series is intended to enhance networking and socializing between undergraduate and graduate alumni. $15 for members, $20 for nonmembers. Our first get-together will feature Professor Joe Kirschvink, *79, Professor of Geobiology at Caltech, who will talk about "Animal Magnetism." One of the longest-standing mysteries in the behavioral and neurosciences is the ability of animals to navigate over long distances in unfamiliar territory. 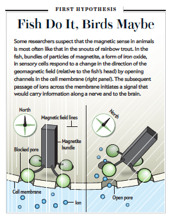 We began work at Princeton over 30 years ago on the idea that animals might make tiny magnets in specialized cells that would give them the ability to use the geomagnetic field as a navigational tool. I will report the latest, exciting findings in the general field of magnetoreception, as well as controversies and the possible presence of similar structures in humans. This event is possible thanks to the generous sponsorship of Paul and Heather Haaga.